Whitfield says what’s needed are more strategies to publicly reward good performers and shame bad ones. There are some good examples to go by. To increase recycling in Japan, some towns required residents to use see-through garbage bags so that a household’s waste stream could be publicly scrutinized. In the U.S., the annually updated Toxic Release Inventory has led to reductions in pollution by making public the emissions of all industrial facilities. 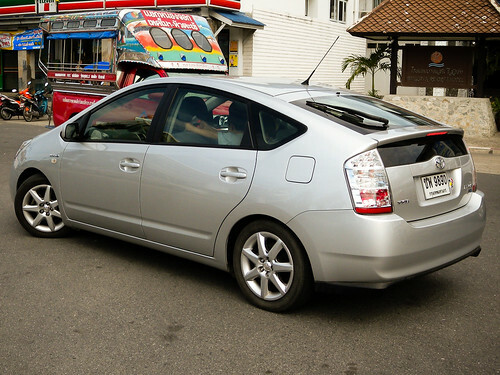 And for consumers, what better way to brand yourself as “green” than driving a Toyota Prius? Green driving reaches the streets of Thailand. Photo: Ian Fuller. Climate change is a thorny problem for shame to solve because those causing the most damage are far removed from those who will suffer the worst consequences. Wealthy Westerners emit the most carbon, but are half way around the globe from vulnerable communities and are distant in time from their great-grandchildren. Chances are they will never even see those faces. Some of this may strike Americans as too much Big Brother. But making public the data on energy use and efficiency would give public interest groups the opportunity to do something with it. Perhaps we should all know who are the energy savers and who are the energy hogs.